German Interior Minister Horst Seehofer's Christian Social Union (CSU) and Chancellor Angela Merkel's Christian Democratic Union (CDU) agreement on migration seems to be a compromise, which could hardly result in a long-term victory for the coalition government amid doubts that the proposed measures could provide a response to unabated migration. On Monday, Seehofer announced that the two sister parties had reached "a clear agreement on how to prevent the illegal immigration at the German-Austrian border in the future." The deal was clinched amid his threats to resign due to his push for harsher migration policy and the possibility of turning away migrants who have already been registered as asylum seekers in other EU countries or denied asylum. 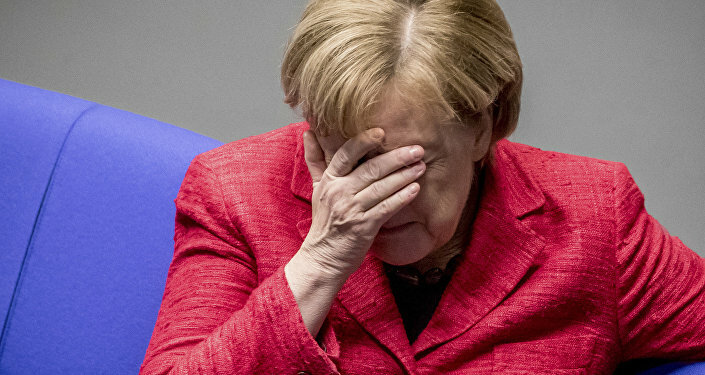 The whole dispute threatened to shatter the fragile German government coalition, struck in March with great difficulties. The chancellor, in turn, said that she was delighted to have concluded a "good compromise" after "difficult days and tough dealings." The compromise stipulates the establishment of "transit centers" for asylum seekers at the German-Austrian border. This is where asylum seekers arriving in the country who have been already registered in another European state are expected to be placed, pending their expulsion to the country of entry. Their referrals to the countries where they were first registered upon the arrival in the union will have to be organized however within the framework of administrative agreements concluded with the countries concerned, the agreement said. The reached agreement has already drawn much criticism. Critical voices express doubt that the reached compromise could be a solution to the problem. In particular, they suggest there will be no way to "empty" these transit camps, since most countries of first arrival steadfastly refuse to take migrants back. Attempts to negotiate such agreements on a one-by-one basis may also prove to be unfeasible. "We expect this German ‘solution’ to be quickly overwhelmed by the sheer numbers of migrants that they will not be able to send back anywhere … except to their country of origin, that they should never have left. Toughness is the only way to stop this disastrous economic migration of unqualified, unemployable people," a European Parliament member from Italy’s Lega Party, Mario Borghezio, told Sputnik. Borghezio also said that hypocrisy was "at the core of all declarations" on the migration issue, slamming European partners who rebuke Italy for its openly tough stance on migration while themselves seeking to quell immigration and avoid their fair share. A radical leftist German leader, Bernd Riexinger, has expressed a similar view, saying that "the proposed transit centers amount to mass internment camps." He asked the Social Democratic Party of Germany (SPD), the third partner of the governing coalition, to oppose this "rightist" solution. In the meantime, new SPD president Andrea Nahles hailed the end of tensions between the two sister parties, "which allows us to get back to work." The party is, however, expected to consider its verdict on its collation partners’ deal later on Tuesday. If SPD were to reject it, all Merkel's efforts to save her government might be called into question. A summit meeting of the three parties of the coalition — CDU, CSU and SPD – is also scheduled for Tuesday. Opposition, in the meantime, believes that the CSU-CDU compromise could hardly be seen as a victory of Seehofer, and is likely aimed at saving faces amid failure to find a solution to the unabated migration. "It was not Horst Seehofer’s success that forced Merkel to begin to change her migration policy. The real issue was the legality of her decision to let everybody in, against all German laws … But this is not the time for us, the AfD, to celebrate a victory either. This so-called compromise does not provide any real solution to the issues of the unabated migration crisis. Neither Angela Merkel, nor Horst Seehofer show any real determination or take the steps needed to end this crisis. It was evidently all about saving faces and sticking selfishly to political power and positions," Joerg Meuthen, the co-chair of the Alternative for Germany (AfD) party, told Sputnik. According to Meuthen, Seehofer's opposition to Merkel's open-door policies comes too late and has been driven by the fear of losses at the October election in Bavaria. "The AfD was the only voice in Germany to accuse Merkel of breaking the law by opening our borders since 2015. 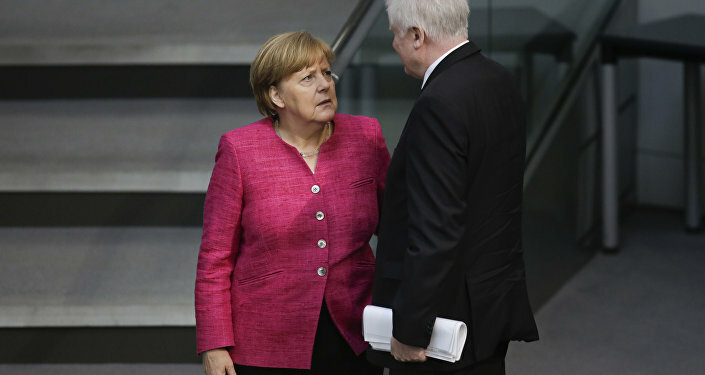 Horst Seehofer did only talk for three years. He did not fight for Germany here. His late posture, his late fight is mainly against Merkel personally and for his CSU campaigners, almost petrified by the fear of losing the upcoming regional election in Bavaria," he said. Aldo Carcaci, a member of the Belgian parliament, very much involved in finding a solution to stop the undesired migration inflow to Europe, suggested that Seehofer might lose his post of CSU head as a result of the October election over his inability to bring about change on migration, despite his well-known harsh stance on the issue. The politician is also similarly pessimistic about Merkel's positions in Germany. "The European citizens are angry, like a majority of Germans, at the complete failure of European policies imposed by Chancellor Merkel. She will not survive for a long time, and her Minister of Interior Horst Seehofer (CSU) has shown a weakness over the last three years, that could mean his demise as head of the CSU at the October Bavaria elections. Four years lost and a terrible problem created for Europeans by Merkel and the like," Carcaci told Sputnik. The projection seems to have grounds, as polls similarly indicate a breakthrough for the far-right in the October vote in Bavaria, which could result in the CSU party losing its absolute majority. Along with the dismal election projections and the assessment of the CDU-CSU deal as a very temporary compromise, the conflict around migration could resurface at any time, while a strong CSU defeat in Bavaria might push the CSU to seek a fresh new start by leaving the coalition, which could further pile pressure on Merkel and her government.